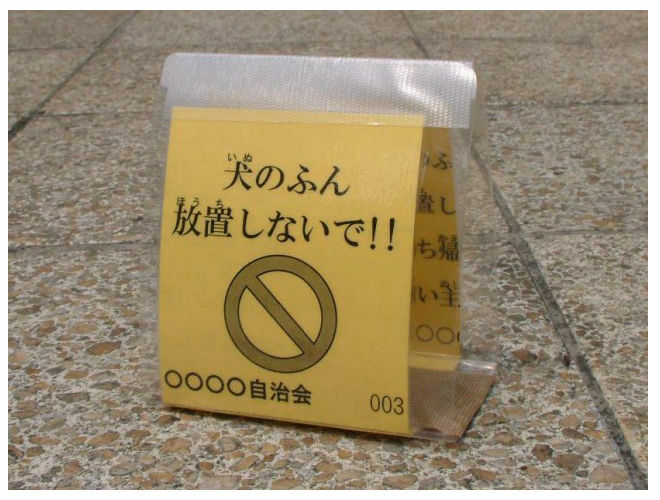 Three days a week Izumisano city in Osaka Prefecture sends “Yellow Card G-men” out in city-owned vehicles on missions to put yellow cards on dog droppings. 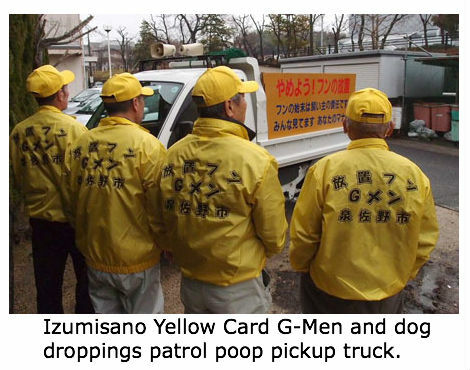 The “Dog feces government men” patrol will keep an eye on the yellow cards and if the droppings are still there 4 weeks later, they’ll clean up the mess. Dog owners usually walk their pets along the same route. 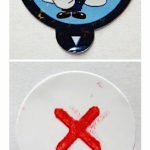 The city is hoping the dog owners will spot their pet’s previous poop, feel guilty about having left it there, and then finally clean it up, so the patrol won’t have to. 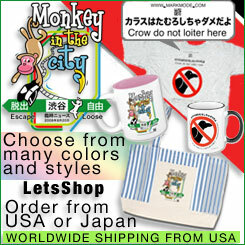 The Yellow Card G-men force is staffed by folks from the city’s Retired Persons Human Resource Center. The average age of the retirees is 75. 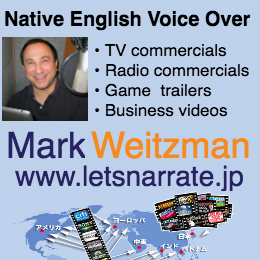 Citizens were not heeding the Izumisano ordinance requiring dog owners to clean up their pet’s droppings. City parks were becoming especially messy. 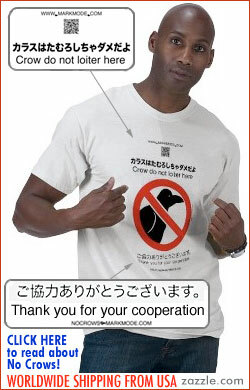 Izumisano is also across Osaka Bay from Kansai International Airport and the town’s mayor doesn’t want dog droppings to be the first thing tourists see. The Yellow Card G-men are also on the lookout for excrement-in-progress. 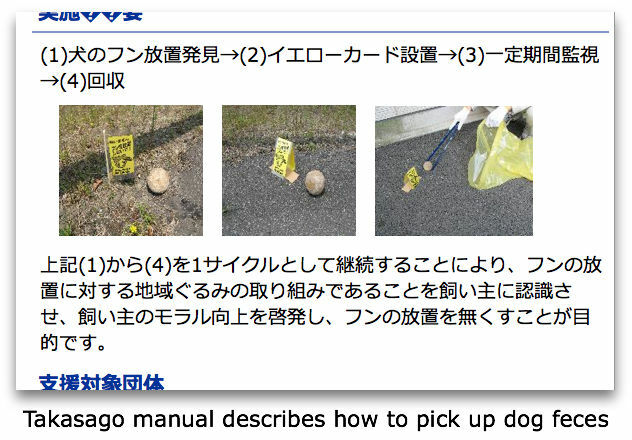 A dog’s owner caught not cleaning up the dog’s droppings will be fined JPY 1000. 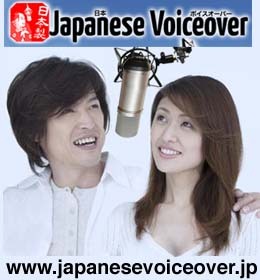 The fine will be raised to JPY 5000 in October 2013. The patrols hunt poop perpetrators in the morning and evening. Neighboring cities are also cracking down on unscooped dog droppings. 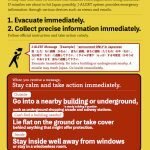 Izumisano has also received a call from officials from Eniwa city, a Sapporo suburb, which also has feces pickup problems. 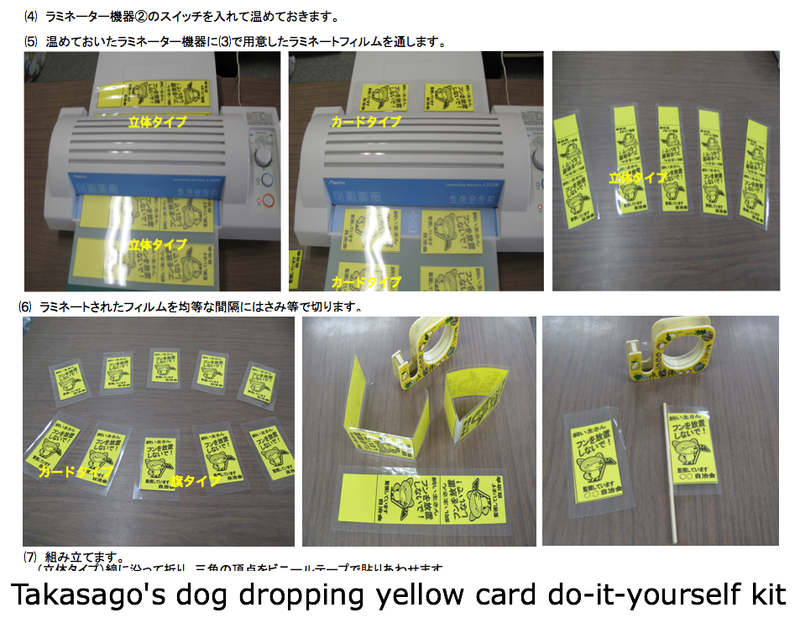 In June the city of Takasago in Hyogo Prefecture began giving free dog dropping collection bags, plastic gloves and waterproof “yellow card” tent cards to citizens upon request.